From New Zealand to Sweden, it's the killer that doesn't discriminate. SYDNEY -- The water of the Waikato River in Hamilton was slowly drifting downstream on a slightly cloudy New Zealand day. The sound of 'Amazing Grace' floated through the air, played by a lone bagpiper standing on the river's bank in this North Island city. In front of her, rows and rows of empty pairs of shoes lined the riverbank in rows and rows of equal length on the grass of Memorial Park. Joggers and heels, leather business shoes, gumboots and thongs; all 606 of the pairs were different in shapes, sizes and colours. Indeed, this was footwear from all walks of life. And at this particular gathering they also stood as a stark representation of the number of New Zealanders who took their own lives between 2016 and 2017. Around 70 people were in attendance to witness the event -- a silent, solemn crowd paying homage to the suicide crisis crippling their country. Among the people in attendance, the bagpiper was also someone who has had a child take their own life. New Zealand's suicide rate has reached a new peak at 606 per year, according to the latest statistics. That puts New Zealand alongside Australia, taking into account the population difference, with a near identical suicide problem (3,027 Australians take their own lives each year). New Zealand and Australia are above average on suicide rates for OECD countries; Spain, the UK and Canada are well behind while NZ and Australia rank comparably to the United States, Iceland and Switzerland. For Dave Macpherson, Memorial Park serves as a sombre reminder of the worst day of his life. His son's body was pulled from the river alongside this park in March 2015. Nicholas Stevens took his own life after multiple stints in an inpatient mental health care centre. He was 21 years old. In among the lines of shoes, Stevens' name could be found etched on a plaque placed on a park bench and dedicated to him with his photo. Macpherson, a Hamilton City councillor and member of the Waikato District Health Board, told HuffPost Australia the emotional gathering was a reminder of how widespread the issue of suicide is, both in Hamilton and around New Zealand. "It's a big debate nationwide -- the last two to three years it's become bigger and bigger. Everyday there are stories either about particular cases or the statistics. It's that people have recognised that it's a hell of a problem," he said. "[The shoes were] incredibly effective. We've had photos of these shoes laid out in the far north and far south of the country, in the main street of Auckland, on a bridge in another city, on the beach today in an ocean-side city. It's an icon that tells a story without needing any words. "The people [in Hamilton] were coming for family or friends and we didn't know them but they all came rushing from down the hill with a pair of shoes for their family members. It was more emotional than I thought it would be." The gathering was part of a national roadshow known as The Shoe Project. It's an initiative of the New Zealand healthcare coalition YesWeCare.nz to highlight the devastating effects of suicide around the country. 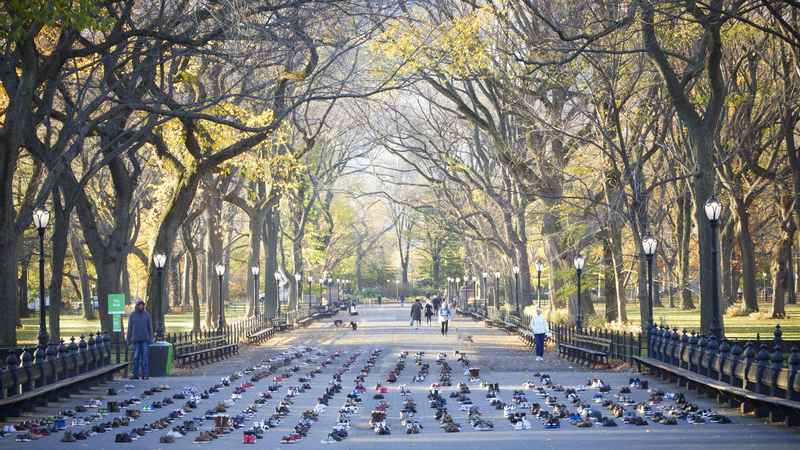 The Shoe Project was designed to bring awareness to the fact that suicide can affect anyone, from any walk of life. New Zealand has a population of almost 4.7 million and the 606 Kiwis who took their lives in 2016-17 show that the problem isn't getting any better. This most recent national suicide rate in New Zealand marks the third consecutive year the figure has risen, as well as the highest number for the country since the start of statistics began being recorded. Campaign organiser Simon Oosterman said the tour of the shoes, mirroring the Maori idea of a hikoi (or protest march across the country), was planned to jump from city to city, ultimately leading to Parliament House in Wellington for International Suicide Prevention Day on September 10. From place to place, the idea was to show Kiwi lawmakers that suicide has become an issue of national importance just as big as Maori land rights, as has been the theme of famous hikois in the past. It has now become the silent, indiscriminate killer that snakes from one New Zealand island to the other, affecting millions from all walks of life, in no particular order. As part of the response formed by the tour group, letters addressed to the New Zealand government were written by mothers who had lost children to suicide. The messages demanded politicians "have the courage to put aside politics and do what's right" by introducing a national suicide reduction target, implementing an independent inquiry into the country's mental health sector and focusing on adequate hospital staffing and services. The hikoi was focussed on the individuals and families affected by suicide across New Zealand. "People talk about numbers -- using shoes and leaving them empty really shows loss and it really shows visually what's happening. People say, 'Gee, is it really that much?' It gives it more meaning," Oosterman told HuffPost Australia. "You need some way that they can easily participate, and everyone's got a pair of shoes and we've got people who might not have lost someone but still wants to contribute a pair of shoes. "We've also got people who have lost someone and want to participate but don't want to come to the events because it's too raw, so they donate a pair of shoes, so those families still feel like they're a part of it." The problem doesn't stop with New Zealand. Suicide is now a major problem in countries around the world. And as the roadshow progressed, and the team behind The Shoe Project came to further realise the extent of the problem, Oosterman said it was the heartbreaking, yet sometimes empowering, stories of the people he met at each local event that revealed the gravity of allowing them to talk about their circumstances. From a mother who hadn't talked about the loss of her child for 25 years but felt supported enough to do so at one of the gatherings, to a 24-year-old from Invercargill who had lost 12 friends to suicide, and another teenager who had attempted taking his own life the night before coming to one of the events, the campaign was offering New Zealanders the opportunity to be part of a solution. "[The teenager] stayed the whole day with us and brought his friends and he felt like he was a part of something, it wasn't a negative thing for him, it was like he a was part of the solution," Oosterman said. "It was a really touching moment. I think we may have saved a life there. "If you don't talk about suicide, that means we're leaving bereaved families at home, on their own, in pain, without sharing it." 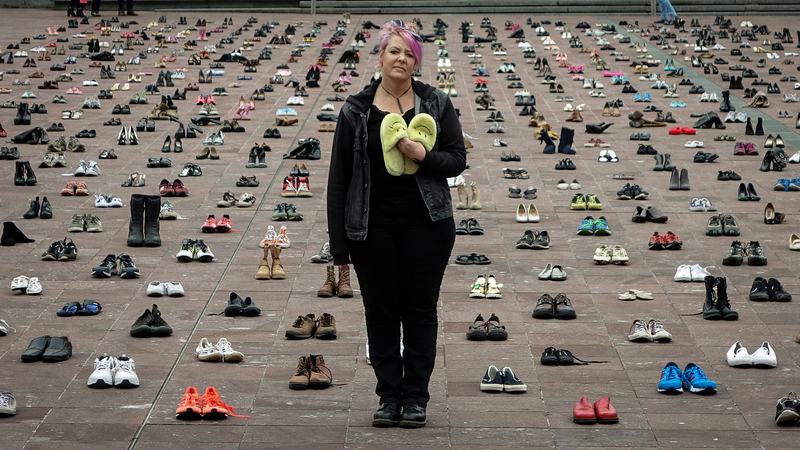 Suicide isn't just felt by families from around New Zealand and Kiwis aren't the only people putting their shoes out to send a message. The issue is plaguing countries around the world and there are people from multiple continents who have realised the power of speaking up. Last year the Movember Foundation, a charity organisation that looks at addressing the biggest health issues faced by men, also arranged empty pairs of shoes in cities around the world as a marker of the devastating effects of suicide on men. Craig Martin, the Movember Foundation's global director of mental health and suicide prevention, told HuffPost Australia the events were organised on November 1 in Australia, the Republic of Ireland, Sweden, the United Kingdom, Canada and the United States to symbolise the extent of loss of human life. From the sunrise-lit, sandy shores of Sydney's Bondi Beach to the paths lining the River Thames under London's iconic Tower Bridge and to the picturesque serenity of New York's Central Park -- an army of shoes, representing the silent, lost lives of millions, show exactly how severe the impact of suicide has become. 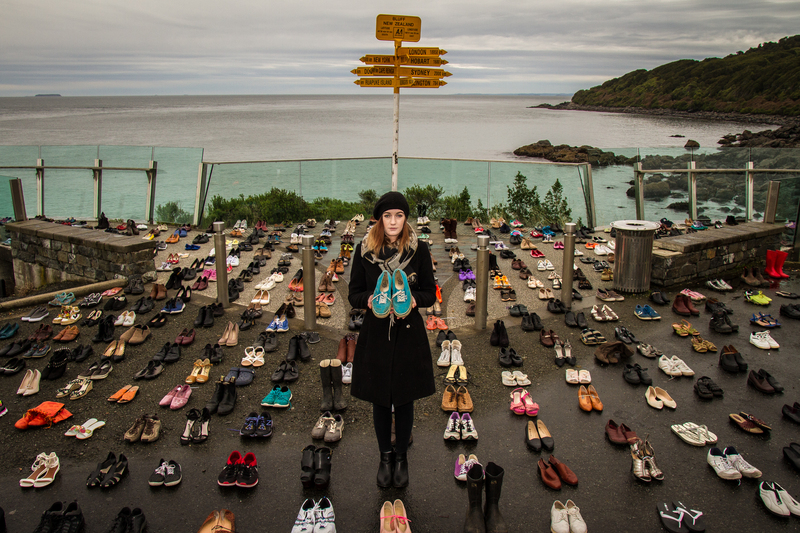 191 pairs of shoes on Sydney's Bondi Beach represented the number of Australian men who take their lives within a month. "Suicide is a massive issue, it's one of our key cause areas that were really passionate about and that we've invested a lot into," Martin said. "When you're talking about suicide statistics, they just become numbers. The sad reality is that you know the devastating effect suicide has on a family and a community and, while it's really easy to talk about numbers, you lose that reality when you do. "Laying out shoes symbolises a human life -- this was a man who existed in the world and meant a whole lot to different people and now they're gone." And in the United States? 1,620 pairs of shoes were lined up in multiple locations across the country. And just like The Shoe Project in New Zealand, Martin also said connecting the empty shoes to the identity of a person was a way for the Movember Foundation to send a strong message and start a crucial conversation. "It's the leading cause of death for young men between the ages of 15-29... [but] statistics can sometimes be so cold," he said. "The [shoe] concept resonated with people and since then people have gone on to replicate that. I think because of that -- it's powerful imagery, it's emotive -- people get more of a sense that these are not just numbers, these are people's lives. Separately to that, people say 'Wow, that's a lot of people'. The response we got was really encouraging. "There's been quite a narrative about, we need to be asking people and men, are they okay? It's trying to get people around to check in and say, 'How are you really going?' and then go through a process of ask, listen, encourage action and check in, it's a four-step process." Another 247 pairs were organised for London's Pottersfield Park in the United Kingdom. That might seem like an easy process on paper -- but Martin also acknowledged that people around the world still struggle with the assumed implications of having conversations about suicide. "People want to be there but they often get concerned that maybe they won't be able to deal with it," he said. "There's sometimes a false belief that if you ask someone if they're thinking of killing themselves that they'll go off and do it and we know from research that that just isn't the case. "It's about helping people to feel confident to have a conversation." 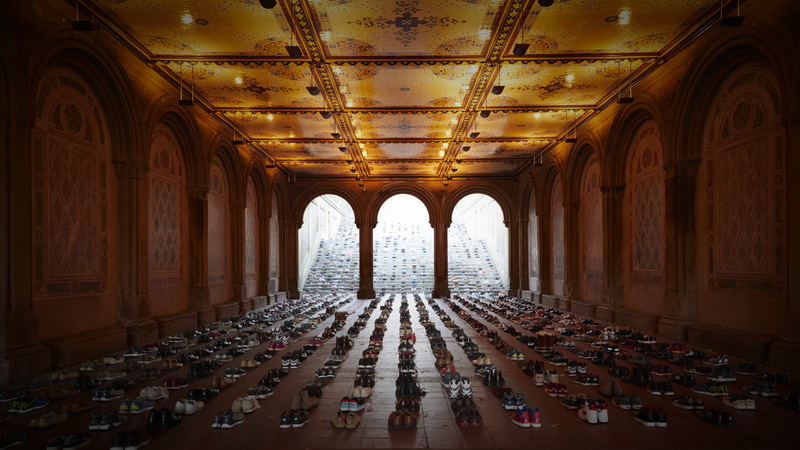 Shoes were also set up in New York's Central Park, as well as 91 pairs in Stockholm, Sweden, 375 in Dublin, Ireland and 136 across Canada. As Dave Macpherson stands still behind the Waikato River, the sound of 'Amazing Grace' washing over him and his eyes jumping from one pair of shoes to another, he finds clarity in his pursuit of an answer: the key to addressing suicide is talking about it. There needs to be a culture change around the way mental health is spoken about and treated for any effective progress to be made. "The first thing, we've got to start people talking about it and the problems they're having. It's a big issue here, including the families in treatment and support planning," Macpherson told HuffPost Australia. "There are some things that are heading in the right direction but there's a whole culture change that needs to happen. "We've had nurses in the mental health sector going onto our son's Facebook page and saying to us, 'You guys should forget about it, it happened two years ago get over it'. That's the attitude of the people who say they're caring for the patients, that's the cultural problem we're up against still." Suicide Prevention Programs Around The World: What Can Australia Learn?